For the comic-book writer, see Arie Kaplan. Aryeh Moshe Eliyahu Kaplan (Hebrew: אריה משה אליהו קפלן‎; October 23, 1934 – January 28, 1983) was an American Orthodox rabbi and author known for his knowledge of physics and kabbalah. He was lauded as an original thinker and prolific writer and is most well known for his translations of the Torah, writings on Kabbalah, and introductory pamphlets on Jewish beliefs and philosophy. His works are often regarded as a significant factor in the growth of the baal teshuva movement. Aryeh Kaplan was born in the Bronx, New York City to Samuel and Fannie (Lackman) Kaplan of the Sefardi Recanati family from Salonika, Greece. His mother, Fannie Kaplan, died on December 31, 1947 when he was 13, and his two younger sisters, Sandra and Barbara, were sent to a foster home. Kaplan was expelled from public school after acting out, leading him to grow up as a "street kid" in the Bronx. Kaplan did not grow up religious and was known as "Len". His family only had a small connection to Jewish practice, but he was encouraged to say Kaddish for his mother. On his first day at the minyan, Henoch Rosenberg, a 14-year Klausenburger Chassid, realized that Len was out of place, as he was not wearing tefillin or opening a siddur, and befriended him. Henoch Rosenberg and his siblings taught Kaplan Hebrew, and within a few days, Kaplan was learning Chumash. When he was 15, Kaplan enrolled at Yeshiva Torah Vodaas, and afterwards went to the Mir Yeshiva in Brooklyn. Kaplan then studied at the Mir Yeshiva in Jerusalem in Israel, where he received semikhah from some of Israel's foremost rabbinic authorities, including Yoreh Yoreh from Rabbi Yitzhak HaLevi Herzog and Yadin Yadin from Rabbi Eliezer Yehuda Finkel in 1956. Upon returning from Israel in the late 1950s, Kaplan taught in Richmond, Virginia and the Bronx before moving to Louisville, Kentucky. In Louisville, he taught at Eliahu Academy and studied at University of Louisville, where he joined Sigma Pi Sigma, the Woodcock Society, and Phi Kappa Phi and eventually completed his bachelor's degree in Physics in 1961. While in Louisville, he met Tobie Goldstein, whom he married on June 13, 1961 and with whom he had nine children. Kaplan then moved to Hyattsville, Maryland to study Physics at the University of Maryland and begin his first professional position as a research scientist at the National Bureau of Standards's Fluid Mechanics Division, where he was in charge of Magnetohydrodynamics research. Kaplan earned his M.S. degree in physics from University of Maryland in 1963. After graduating, Kaplan remained at University of Maryland as a National Science Foundation fellow through the fall semester of 1964. In 1965, Kaplan switched careers and began practicing as a rabbi. On February 19, 1965, Kaplan moved to Mason City, Iowa, where he became the Rabbi of Adas Israel. On August 7, 1966, Kaplan became the Rabbi at B'nai Sholom, a Conservative synagogue in Blountville, Tennessee. He held the position through 1967. In 1967, Kaplan became the Rabbi at Adath Israel (now known as Adath Shalom), a Conservative synagogue in Dover, New Jersey. He kept this position through 1969. Kaplan then moved to Albany, New York, where he became the Rabbi at Ohav Shalom, a Conservative synagogue. During this time, he also functioned as the president of the AJCC (Albany Jewish Community Center) and the Hillel Counselor to the B'nai B'rith Hillel Counselorship at University at Albany, SUNY. Kaplan died at his home of a heart attack on January 28, 1983, at the age of 48. He was buried in the Mount of Olives Jewish Cemetery, in East Jerusalem, off Aweiss street, in the part known as "Agudas Achim Anshei America", "Chelek Alef" (Portion 1). The Aryeh Kaplan Academy day school in Louisville, Kentucky is named in honor of Rabbi Aryeh Kaplan. His monument says that he was successful at doing Kiruv. Kaplan produced works on topics as varied as prayer, Jewish marriage and meditation; his writing was also remarkable in that it incorporated ideas from across the spectrum of Rabbinic literature, including Kabbalah and Hasidut. His introductory and background material contain much scholarly and original research. In researching his books, Kaplan once remarked: "I use my physics background to analyze and systematize data, very much as a physicist would deal with physical reality." This ability enabled him to undertake large projects, producing close to 50 books. His works have been translated into Czech, French, Hungarian, Modern Hebrew, Portuguese, Russian, German and Spanish. From 1976 onward, Kaplan's major activity was the translation into English of the recently translated (Ladino into Hebrew, 1967) anthology, Me'am Lo'ez. He also completed The Living Torah, a new translation of the Five Books of Moses and the Haftarot, shortly before his death. Kaplan was described by Rabbi Pinchas Stolper, his original sponsor, as never fearing to speak his mind. "He saw harmony between science and Judaism, where many others saw otherwise. He put forward creative and original ideas and hypotheses, all the time anchoring them in classical works of rabbinic literature." His works reflect his physicist training—concise, systematic, and detail-oriented. His works continue to attract a wide readership, and are studied by both novices and the newly religious, as well as by scholars, where his extensive footnotes provide a unique resource. "Torah Anthology," a 45-volume translation of Me'am Lo'ez from Ladino (Judæo-Spanish) into English. Rabbi Kaplan was the primary translator. "Tefillin: God, Man and Tefillin"; "Love Means Reaching Out"; "Maimonides' Principles"; "The Fundamentals of Jewish Faith"; "The Waters of Eden: The Mystery of the Mikvah"; "Jerusalem: Eye of the Universe" — a series of highly popular and influential booklets on aspects of Jewish philosophy which span the entire spectrum of Jewish thought, as well as various religious practices. Published by the Orthodox Union/NCSY or as an anthology by Artscroll, 1991, ISBN 1-57819-468-7. "The Real Messiah? A Jewish Response to Missionaries" at the Wayback Machine (archived May 29, 2008). "If You Were God," his final work, was published posthumously in 1983. Moving beyond superficiality, the slender book encourages the reader to ponder topics concerning the nature of being and Divine providence. Kaplan translated and annotated classic works on Jewish mysticism — Sefer Yetzirah, Bahir, and Derekh Hashem — as well as produced much original work on the subject in English. His Moreh Ohr, a Hebrew-language work, discusses the purpose of Creation, tzimtzum and free will from a kabbalistic point of view. Kaplan wrote three well-known books on Jewish meditation. These books seek to revive and reconstruct ancient Jewish practices and vocabulary relating to meditation. He also wrote and translated several works related to Hasidic Judaism in general, and to the teachings of Rabbi Nachman of Breslov in particular. Oneda, S.; Kim, Y.S. ; Kaplan, L.M. (1964). "Final-state interactions in η 0 → 3π decay". Il Nuovo Cimento. 34 (3): 655–664. Bibcode:1964NCim...34..655O. doi:10.1007/BF02750008. Kaplan, L.M. ; Resnikoff, M. (November 1967). "Matrix Products and the Explicit 3, 6, 9, and 12-j Coefficients of the Regular Representation of SU(n)". Journal of Mathematical Physics. 8: 2194–2205. Bibcode:1967JMP.....8.2194K. doi:10.1063/1.1705141. Archived from the original on 2013-04-11. 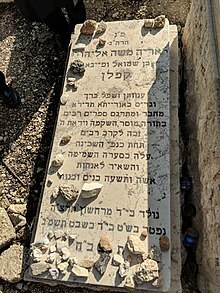 ^ "Rabbi Aryeh Kaplan's gravesite". Briskodesh.org. Archived from the original on 2015-01-09. Retrieved 2014-11-11. ^ a b Kaplan, Aryeh (1983). The Aryeh Kaplan Reader: The gift he left behind: Collected essays on Jewish themes from the noted writer and thinker. Brooklyn, N.Y.: Mesorah Publications, Ltd. p. 13. ISBN 0-89906-173-7. ^ Kahn, Rabbi Ari (2005-01-27). "Age of the Universe". aishdas.org. Retrieved 2014-11-11. ^ a b c d "Rabbi Aryeh Kaplan: Words to live by". New York Jewish Week. 21 September 2010. Retrieved 2014-11-11. ^ "A Tribute To Rabbi Aryeh Kaplan". bible.ort.org. 1983. Retrieved 2014-11-11. ^ "AN APPRECIATION OF RABBI ARYEH KAPLAN + VIDEO". ncsy.org. Retrieved 2016-11-13. ^ Sixteenth Census of the United States, United States Census, 1940; Assembly District 5, Bronx, New York City, Bronx, NY; roll T627 2476, page 10B, line 47. Retrieved on 2015-05-20. ^ a b c d e f g h Who's Who in the East, 17th edition. 1979. ISBN 978-0837906171. ^ Embracing a Street Kid, Seltzer, Nachman (June 21, 2010). One Small Deed Can Change the World. Shaar Press. pp. 252–255. ISBN 9781422609897. ^ "File:Rabbi Aryeh Kaplan's Semicha from Rabbi Eliezer Yehuda Finkel.jpg". Mir Yeshiva (Jerusalem). June 28, 1956. ^ "Rabbi starts service in Mason City". "Mason City Globe Gazette". Mason City, Iowa. February 27, 1965. p. 4. Retrieved 2019-01-15. ^ "File:Aryeh Kaplan BS.JPG". University of Louisville. ^ a b "Rabbi Aryeh Kaplan, 48, Dies; Wrote Books on Jewish Topics". The New York Times. 1983-02-02. Retrieved 2014-11-11. ^ "They came from Maryland". "Mason City Globe Gazette". Mason City, Iowa. April 3, 1965. p. 8. Retrieved 2014-11-11. ^ "Physicist Is Rabbi For Area". "Kingsport Times". "Kingsport, Tennessee". July 22, 1966. p. 13. Retrieved 2014-11-11. ^ "Rabbi arrives in Mason City". "Mason City Globe Gazette". Mason City, Iowa. February 20, 1965. p. 26. Retrieved 2014-11-11. ^ "Weekend worship in Mason City's churches". "Mason City Globe Gazette". "Mason City, Iowa". November 20, 1965. p. 5. Retrieved 2014-11-11. ^ "Encyclopedia of Southern Jewish Communities - Bristol/Johnson City/Kingsport, Tennessee". Goldring/Woldenberg Institute of Southern Jewish Life. Retrieved 2017-11-29. ^ "B'nai Sholom To Have Installation, Reception". "Kingsport Times". "Kingsport, Tennessee". August 7, 1966. p. 21. Retrieved 2014-11-11. ^ "CONGREGATION B'NAI SHOLOM RECORDS". East Tennessee State University, Archives of Appalachia. Retrieved 2018-01-21. ^ Baruch Frydman-Kohl. "H-net Discussion Networks - Aryeh Kaplan". "Humanities & Social Sciences Online". Retrieved 2014-11-11. ^ "Project to Rediscover Jewish Values Launched by Students at State University of N.Y." "Jewish Telegraphic Agency". "Albany, New York". July 7, 1970. Retrieved 2014-11-11. ^ "Albany State U Administration Refuses to Close School for Passover; Students Vow Boycott". "Jewish Telegraphic Agency". "Albany, New York". April 17, 1970. Retrieved 2014-11-11. ^ "File:Aryeh Kaplan's Citation of Service from the B'nai B'rith Hillel Foundations.jpg". B'nai B'rith Hillel Foundation. June 2, 1971. ^ "Rabbi Aryeh Kaplan Dead at 48". JTA.org. February 2, 1983. ^ "Changing Places: Scouting a variety of out-of-town relocation options at OU Jewish Communities Fair offers a lesson in choosing" (PDF). ou.org. Retrieved 2018-09-06. ^ a b "Rabbi Aryeh Kaplan". ou.org. June 14, 2006. Retrieved 2014-11-11. ^ Gelbach, Sharon (November 14, 2018). "Like His Own Children". Mishpacha (735). Retrieved December 19, 2018. ^ "Collectible: Rabbi Aryeh Kaplan Interview". JInsider.com History Preservation Project. Archived from the original on 18 April 2010. Retrieved 2014-11-11. ^ a b } "Rabbi Aryeh Kaplan - Words to live by". Jewish Week. September 21, 2010. ^ "Recommended Reading List—6. Philosophy". Ohr Somayach Interactive. 1998. Retrieved 2014-11-11. ^ "If You Were God?". Mesorah. Archived from the original on 2014-11-11. Retrieved 2014-11-11.